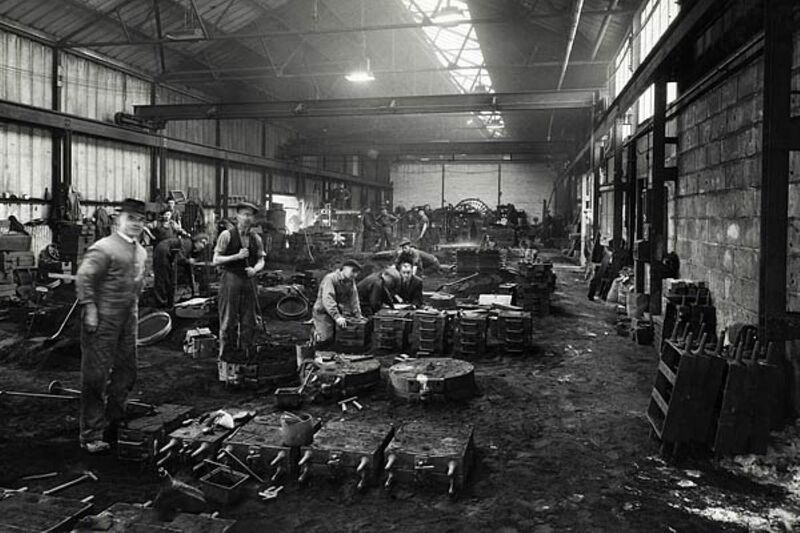 The Company has, in its time, operated two foundries. The first, ‘The WATERBEER STREET FOUNDRY’ was built by Kingdon & Sons in about 1805 in the street that bears that name to the rear of the Guildhall. 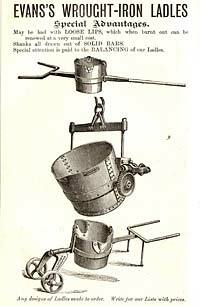 It remained in constant use up until 1939. 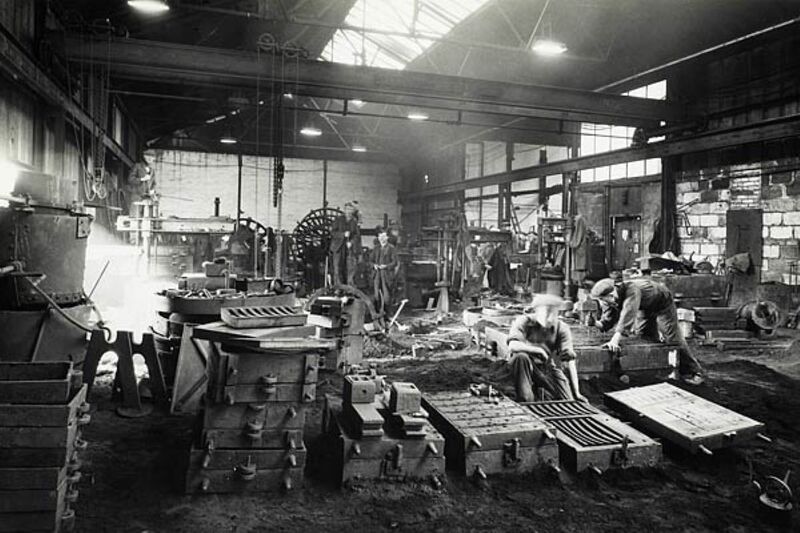 The second foundry was built in1939 and became known as the ‘TAN LANE FOUNDRY.’ The Foundry and its associated facilities remained in continuous use up until 1979 when Garton & King Ltd went into voluntary liquidation, the Foundry closed and the site was disposed of. This chapter has separate pages on both the Waterbeer Street and the Tan Lane Foundries. Both the words Foundry and Founding come from the Latin, FUNDERE - to pour and having got that jewel of knowledge over to you, the website viewer, my skills of being able to impart further knowledge on this subject are now about to be severely taxed. 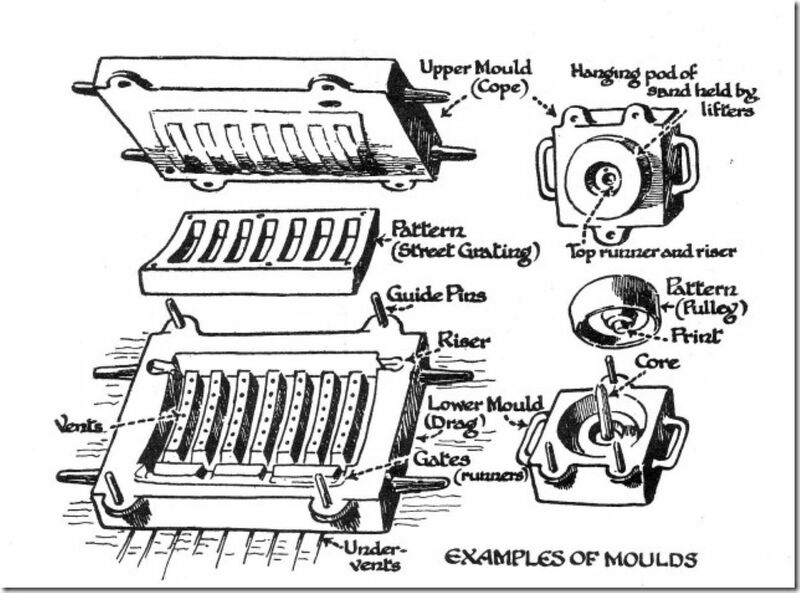 In a moment of enthusiasm I thought it would be a good idea to explain how metal is cast and how moulds are created; what a mould is made out of and how to ensure that the end product is not only suitable but fit for purpose and without faults or failings. 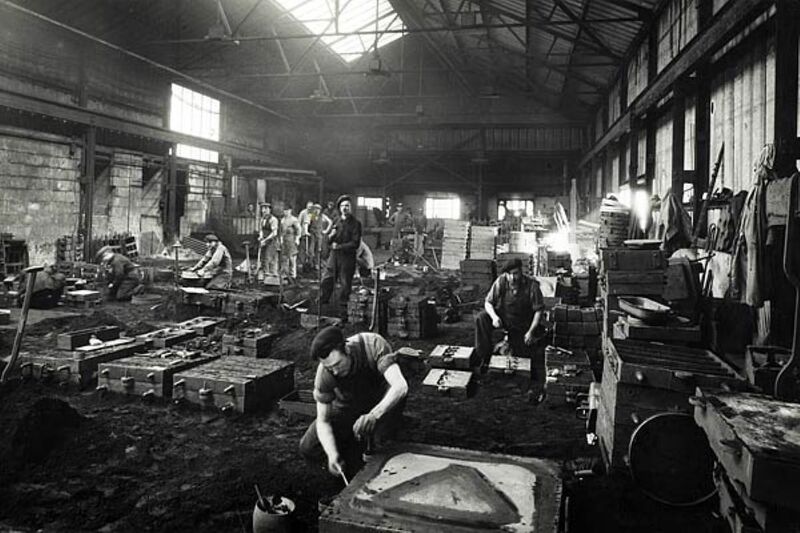 No easy task for someone with no experience of working in a Foundry. There are , of course, books on the subject. The 1911 Edition of the Encyclopaedia Britannica being a particularly 'Good Read' - start with the Volume which covers the letters FO for Founding! Lesser mortals may set their sights on a neat little publication by Claude Wylie, published in 1895 by and for Thomas Reed & Company titled "A Treatise in Iron Founding" - I must stress that it is illustrated and has some interesting adverts at the back for Pig Iron Breaking Machines, Cupolas, Wrought Iron Ladles and all Foundry Requisites. It is unfortunately long since out of print and is unlikely to appear either on Amazon or E Bay. Should you find a copy pick a night when there's nothing but repeats on the telly (most nights) and retire to bed with a cup of Horlicks. It is unlikely that you will get past "Casting in Primitive Times" before your eyelids become heavy and you begin to doze off! Only 160 more pages to go! When I attempted this task (without the benefit of the Horlicks) I only got as far as the end of the first line as I was sidetracked to do a Google search to find out who this bloke Tubal Cain was! Had I read a few more lines all would have become crystal clear - he was the son of Lamech - as the advert says - simples! In truth the book is most informative, in the last few pages it stresses that a piece of work (moulding) can only be done once and if it is imperfect in any essential particular it is spoiled and reverts to scrap and one begins anew. The neglect in moulding of even some trifling thing may damage the whole casting. "In conclusion, we would address apprentice moulders - by whom we hope this book will be much read - in following words of advice - "strive to be master of your trade and excel in it; wish rather for that than a big pay, as the pay is bound to follow; be always ready to give attention to your foreman's advice, and never think any work beneath you, as in such a trade as moulding something can be learned in work however mean"
For readability and value as a work of reference the METHUEN'S OUTLINE Series were highly valued by both secondary and junior schools and these source books filled many shelves in school libraries in the early and middle sixties. If you have read through the History of Garton & King in both versions on this website you will be aware of the input of Mr Sam E. Ellacott. His drawings appear in the Golden Hammer and his text in that publication was adapted in part from our Nancy Lovely's 1939 History which also appears on this site. 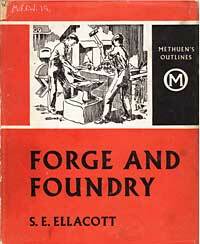 Sam Ellacott was at one time employed in G & K's foundry and went on to write and illustrate the edition "Forge and Foundry" and it is this edition in the Volume "Technology & Transport" that is the first contender. The Second contender has to be a LADYBIRD BOOK ! 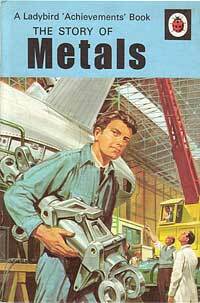 In the series "Achievements" books appears THE STORY OF METALS. Now this is my definite favourite - not only because the print is bigger but the pictures are in COLOUR! On a serious note it covers briefly but factually the fascinating story of man's discovery of metals, how he has used them over time and how they were discovered but also how metals were worked, mined, melted and smelted and the growth of the Iron and Steel Industry. In this day and age many of you do your reading only on the computer screen and haven't picked up a book in ages - shame on you I say - they don't bite and they aren't subject to scares and hazzards that bug your computer. However, for those of you who fall into this category here are a few sites to visit that will fill in the gaps of your knowledge in the wonderful world of casting. There is also this video from Google Video. Well, I think I have successfully side stepped the issue of explaining what a foundry is and how metal is cast, but I gain comfort from the fact that, if you didn't know the answers before, you at least now know how to find out! Another interesting film called 'Casting in Iron' can be viewed on the British Pathe Website by following THIS LINK.